It’s official. We are “dried-in”. While this term would make a high school grammar teacher cringe, it is a common term that is used loosely in the construction world to indicate the point when - although still a long way from finished - we can finally keep the elements out of the building (!). The main accomplishments required to get from “rough-framing” to “dried-in” are: a.) installation of the exterior doors & windows, b.) installation of the “weather resistive barrier” or “building wrap”, and c.) installation of the roofing membranes. In our case this phase also included the installation of the glass block into the new large vertical opening in the brick wall facing the alley. Since weather is hard to predict most construction projects get rained on a few times before they are officially dried-in. In our case, we did not make it to dried-in before getting some rain, so the framing and sheathing did get wet a few times. But thankfully, we had some nice dry and windy days between storms so the building was able to thoroughly dry. And since we chose AdvanTech for the floor and roof sheathing we could rest a little easier since the products are designed to withstand moisture during construction. The glass block installation required careful planning and execution since the opening is twenty three feet tall so any deviation would translate into the block being out of level or plumb from the bottom of the opening to the top. Luckily our masons did a great job in preparing the opening and in installing the block and the finished result is something we are very happy with. Since this old DC Rowhouse in the Pleasant Plains neighborhood still had the original wood frame, single-pane windows, we decided to replace all of the exterior doors and windows in the project. The product we chose for this project is Weathershield’s Contemporary series. We love this manufacturer and these windows in terms of the look and the quality. The Contemporary series offer more modern narrow exterior frame and sash profiles which is perfect to complement the more modern character of the new portions of the building (additions). The eight-foot-tall triple-sliding glass doors, and the large four foot by seven foot fixed glass window at the top of the glass block opening were very heavy so moving them to the 3rd floor and maneuvering them into place required an experienced (and strong) crew. We are very happy with the large glazed areas that will bring lots of natural daylight into the space. The weather-resistive barrier and flashing tapes that we have selected are manufactured by Pro Clima (a German company) and sold by 475 High Performance Building Supply. We selected these products since they are vapor open and will help to provide a weather tight enclosure that still allows moisture to escape through the envelope from the interior to the exterior. (We should note that currently we have only installed a base layer of Typar, a common building wrap, to cover the exterior walls, the Proclima membranes and flashing tapes (we’re using the Adhero & Solitex UM) will be installed over the Typar when it is time for the installation of the exterior metal cladding (stay tuned for more about this in a future post). For the roofing we chose TPO (short for “thermoplastic polyolefin”) for the upper roof and torch-down membrane roofing for the balconies (since they will eventually be covered with floating pavers). TPO is considered to be the roofing material of choice for flat roofs today in terms of durability and maintenance. Since the pavers will ultimately absorb the vast majority of the UV light (the part that is destructive to building products) we decided that the TPO was not necessary for the balcony waterproofing. During the early portions of a renovation project patience and a good dose of faith are sometimes required since progress often seems slow and is less evident to the observer. But things finally seem to speed up once the portion of the construction referred to as “rough framing” begins. Why do we refer to this phase as “rough” framing? The framing part is pretty obvious, we are building “framed” portions of the building envelope with wood studs, joists and rafters. The rough part is a reference in contrast to “finish” carpentry, which refers to the trim, moldings, cabinetry, etc. that will come later. The rough framing or rough carpentry is referred to as “rough” since it is the structural portion of the carpentry that can be left rough since it will eventually be covered up by other finish materials. The rough framing is a pretty exciting time since it is the portion of the project when things move quickly and when the shell of the building really takes shape. Here in the North America (mostly US and Canada), where commercial forests are relatively abundant and soft-wood lumber is plentiful and cheap (relatively speaking), wood framing is the most common type of construction for homes and smaller residential buildings. Wood framing is particularly well suited for building additions onto older masonry buildings since it is relatively lightweight, yet strong and ductile, and also creates cavities that can be insulated within the walls and roof assemblies. Wood framing is also notable in it’s adaptability. Since wood members are cut and fastened together on site with relatively simple hand-held tools, it lends itself to creating custom sizes and configurations for walls, roofs and window openings. With the newly framed rear and upper level building additions in place the size of our project has significantly grown in area, especially when viewed from the rear (something the neighbors have certainly noticed). With this project we are pleased with the resulting proportions and sight lines. In fact, due to the set-back of the new upper addition from the front wall of the original building, the upper-story addition is not even visible from the sidewalk in front of the house, and just barely visible when viewed from across the street. The volumes of the rear additions were designed to step in and out with balconies and are topped with an overhanging roof. The result is that the building feels less bulky when viewed in context with the neighboring houses. We have designed several projects that included either “pop-up” and “pop-back” type additions here in DC. These types of additions are somewhat controversial since many examples lack proper consideration to proportion and detail, and are often built in the place of traditional architectural features that have been removed. As we described in our earlier post “Design Approach” from August 10, we worked to place the volumes of the additions for this project in ways that fit within the new restrictions of the 2016 Zoning Regulations and within our own design criteria of hoping to conceal the additions. Based on the early glimpses of the framed building additions, we feel confident that our design objectives for the building additions - that they are visually and proportionally complimentary to the original row-house – should prove to be successful. Now that the framing of the building envelope is complete, the next objective will be to get the exterior doors and windows installed, the roofing membranes installed and the building wrapped with a weather-resistant barrier so that we can keep the moisture from entering the inside of the house. At that point the house can be considered dry on the inside and we can actually start turning our focus to the interior finishes. On September the 26th, UDC hosted a Green Building seminar on air barriers. This was the last in a series of seminars organized by DCRA. If you are interested in attending any, they will resume in the spring of 2019. These seminars are free and open to the public so they are usually well attended and presented by people who are passionate about their subject. Air barriers are defined as a “material or materials assembled and joined together to provide a barrier to air leakage through the building envelope. An air barrier may be a single material or a combination of materials”. Air barriers stop the uncontrolled flow of air through a building’s exterior envelope. Airflow is caused by air moving from high pressure to low pressure. This moving air carries both heat and moisture. It can carry 50 to 100 times more moisture than diffusion alone. This is a huge consideration in a climate zone with high humidity such as ours; here in DC an air barrier becomes an even more essential component of any wall assembly. a) Wind – on the exterior of a building creates positive pressure on the windward side and negative pressure on the leeward side which draws air through the building. b) Stack Effect – warm air rises and cool air sinks. c) Mechanical Pressure – caused by supply and exhaust imbalances. We’ve all had the experience of standing beside a window and feeling cold. This is a common air barrier failure, and is an example of infiltration which is often caused by poorly sealed joints between adjacent building components. An example of exfiltration happens when a positively pressurized building has holes in the wall assembly. The pressure forces warm air through the insulation and into the wall cavity which cools causing condensation within the wall cavity. High pitched roofs allow for passive ventilation (through the stack effect). Attic vents, dormer windows, vented soffits create heat differentials that allow for warm, moisture-laden air to rise and exit the building and cool air to enter. Historically, buildings were not constructed to be airtight. They were drafty and poorly insulated but that also meant they had a lot of drying potential. But construction has changed, moving from masonry walls to the modern cavity wall. Interior finishes became more sensitive to relative humidity, residential HVAC proliferated increasing the need for more airtight homes. In response, the International Residential Code (IRC) adopted requirements for a continuous vapor barrier in 2009 following the International Building Code’s 2006 requirement. In traditional masonry buildings, the air barrier is the wall itself. The thickness of the brick, paint on plaster, taped drywall or just paint on a brick wall all act as air barriers. Still, air leakage is quite common in these buildings. It is very difficult to make these layers continuous around the entire perimeter of the building envelope. When retrofitting older masonry buildings a lot of extra attention and detailing are required to eliminate gaps or leaks within the air barrier. With the addition of air barriers, vapor barriers and proper thermal insulation, it becomes very important to take into account the unique hydrothermal properties of masonry walls. Misapplications can result in harmful effects like spalling since brick is designed to dry to both sides. Also the historical character of the building or neighborhood should be taken into consideration in any retrofit of a masonry building since it could result in changes to the exterior of the building. 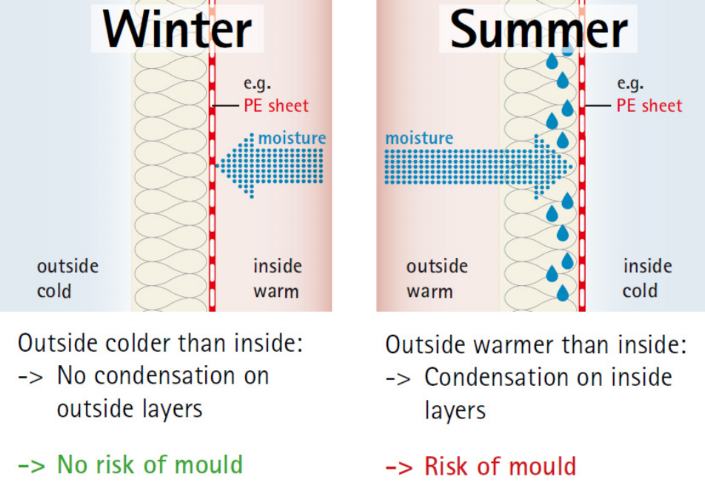 The most important thing to remember about air barriers is continuity! A simple rule of thumb is on a drawing you should be able to put your finger on the air barrier and trace it around the entirety of the building perimeter without picking your finger up. self adhered membranes (peel and stick). There are several methods that are commonly used to measure the air-tightness of houses and buildings today. Blower door tests are used to help identify problem areas. A blower door is a powerful fan that mounts into the frame of an exterior door. The fan pulls air out of the house, lowering the air pressure inside. The higher outside air pressure then flows in through all unsealed cracks and openings. These tests determine the air infiltration rate of a building. Infra-red cameras can give real-time thermal images of the whole or parts of your home. When the blower door test is paired with a thermographic inspection, they can show exactly where cold air is flowing into your home. These tests must performed by professional energy auditors. It is important to employ these measures intermittently during the construction process since these tools are the best way to determine whether the assemblies are air-tight. They need to be carried out during construction while the building envelope components are still accessible (so that problem areas/leaks can be identified and fixed). If you are renovating, building an addition to your existing house, or building from the ground up, you should familiarize yourself with Table 402.4.1.1 in the International Energy Code(IECC). In DC the Green Building reviewers at DCRA will check to make sure that this table and the components of the air barrier are properly identified in the drawings when a building permit is under review. Air sealing also makes a big difference to indoor comfort. If you have an older leaky home and don’t want to spend the money on expensive retrofits you might want to spend some time on simple air-sealing efforts like caulking around window frame perimeters and electrical outlets and checking wall/ceiling joints for leaks. Ensuring that windows properly lock and seal and adding door sweeps also make a big difference. Weather-stripping, the process of sealing around doors, and windows, is another simple and cheap way to mitigate leakage without breaking the bank. · Attic connection between top-plate and drywall in the interior of building. With an airtight house you will have lower heating bills, fewer drafts (i.e. more comfort), reduced chance of mold and rot because of moisture, and a better performing ventilation system. Now that’s a wrap! While the steel fabrication crew was busy installing the steel frame, our general contractor was able to work on reframing the existing floors. This is the other major type of re-strengthening work on a renovation project like ours. With the removal of the old interior walls, the original floor joists are effectively left unsupported in the middle and the distance that they “span” is now the full width of the house. Also as part of our new design, the stairway is being relocated from it’s original location to a new location along the alley side wall at the rear of the house. In order to move the stairway an entirely new opening in each floor has to be created for the stairway to fit into. All of this reframing was installed in accordance with the structural engineer’s framing plans and details. In areas where the span distance of the original floor joists has been increased by the removal of interior walls the structural engineer has called for new wood floor joists to be “sistered” along the side of each existing joist. Sistering is a term that refers to connecting a new joist into the old joist by installing equally spaced screws through the side of the new joist into the existing joist for the entire length of the span. With the new joist “sistered” to the old the two effectively act as one stronger joist. 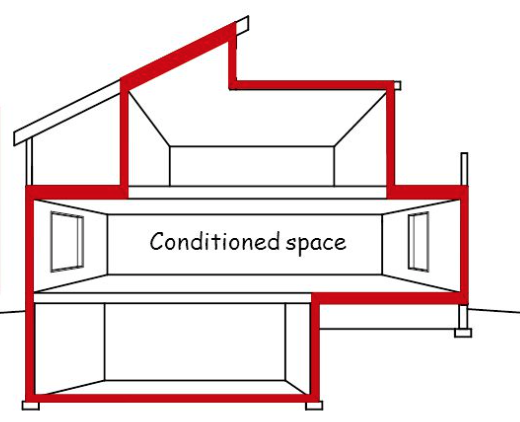 In certain locations (such as the perimeter of the floor openings for the new stairway) stronger wood beams are needed to carry the larger concentrated loads that occur from attaching the stairway and the adjacent floor areas. In these locations engineered lumber is typically used instead of standard framing lumber since it is stronger. The term engineered lumber is used to describe a variety of different products, but all engineered lumber products are made from wood fibers, veneers, or layers that are bonded together with adhesives in a factory. While the manufacturing of engineered lumber does come with a variety of factors that can increase it’s overall sustainability as a building product, a major advantage comes from the fact that engineered wood does not require the harvesting of large mature trees since the wood fibers used in it’s production are generally from smaller and younger trees. is For our project the engineer called for “LVL” beams (LVL stands for laminated veneer lumber) in these locations. Our framing crew had to remove sections of the old floor framing and cut “pockets” into the old masonry walls in order to insert the new beams. Once all of the new joists and beams were installed the original subfloor boards were removed and a new layer of “Advantech” floor sheathing was installed. Advantech is a great new plywood flooring and wall sheathing product that has greater moisture resistance, stiffness and fastener holding characteristics than typical plywood. The Advantech sheathing also has a “tongue & groove” profile along the edges of the panels allowing them to interlock for greater strength. Now that all of the interior floor levels have been re-framed our contractor can turn their attention to re-building the garage at the rear of the house. Once the new garage is in place they will be able to start framing the new rear walls and then the new addition at the top of the house – very exciting! · While the US comprises only 4% of the world’s population, we produce 15% of all greenhouse gas emissions. Washington DC, the city we call home, has striven to be a leader in sustainability. In 2017, DC was named the first LEED Platinum city in the world. In this spirit, DC has committed to becoming a carbon neutral city by 2050. The built environment will play a critical role in mitigating the effects of climate change. Tommy Wells, the director of DOEE, opened the workshop by saying, “We don’t tear down a lot of buildings in DC. So new buildings must be rock-stars, and we need to learn how to retrofit the existing stock” in order to address global warming, climate change and issues of resilience. So what is net zero, you might ask? The Net Zero Energy or Zero Net Energy building (ZNE) is defined as: an energy-efficient building that produces at least as much energy as it uses in a year, when grid-supplied energy is accounted for at the source (including primary energy for generation, transmission and delivery to the site). A study conducted a decade ago revealed that NZE buildings were possible in every climate zone in the US, and today there are many are examples across the country. Schools are currently the most common NZE buildings by type, followed by offices and multifamily construction. The main benefits of these hyper efficient building are: reduced greenhouse emissions, increased productivity and well-being of occupants, and Savings (Utility bills). One of the case-studies presented at the workshop was The American Geophysical Union building, currently under construction right here in DC (200 Florida Ave, NW). This is a conversion of an old building into an exemplar of energy efficiency and modern amenities. The new facility will boast a solar array, a roof garden, a green wall that runs the height of the interior space, dynamic glass shading, radiant cooling ceiling panels and a sewer heat exchange to name a few. The USGBC will be holding tours of the building on October 24th so sign up! If you happen to be in Virginia, you might want to visit one of VMDO Architects’ pioneering high-performing projects. They gave a presentation on their award-winning net zero elementary school, Discovery Elementary, a recently completed in Arlington, Virginia. For more examples, NBI has a database of North America’s most advanced energy efficiency commercial projects including zero and ultra-low energy projects. So what goes into achieving a net zero building? All the presenters at the conference stressed the importance of engaging stakeholders and setting target performance metrics early in the design process (and to define them in the RFP). Once the design team is put together and everybody is on board, owners, occupants, and the design team members should come together to brainstorm potential strategies and technologies in what are called Integrated design Charettes. Iterative energy modeling is critical for hitting those targets. Monitoring building and occupant patterns will ensure that you not only design to net-zero but that your building actually performs at net-zero. In an effort to be sustainability leader, DC has set some ambitious goals for the future of our city. Clean Energy DC is DC’s Climate Mitigation Plan. It includes DOEE’s Sustainable DC 2032 climate and energy targets. By 2032 all new construction in DC will be (required to be?) Net Zero. Greenhouse gas emissions will be reduced by 100% by 2050. DOEE’s 50/50/50 challenge seeks to cut energy use by 50%, increase the use of renewables by 50% and reduce greenhouse gas emissions by 50%. DCRA will be adopting codes that mandate new residential construction to be net zero by 2020 and new commercial construction by 2026. They also announced that in the coming months they will be introducing “Appendix Z” – an incentivized, voluntary net zero building program for residential and commercial buildings. These objectives together are conceived of as a grass roots effort, driven by the community to encourage early adopters to lead the way and prime the industry for the city’s net-zero goals. The first phase of any renovation project is demolition, or more accurately, “selective demolition”. We typically prepare specific demolition drawings which indicate specific parts of the building to be removed in order to accommodate the new design. The removed components usually include walls, roofs, floors (or portions of them), windows, doors, cabinetry, plumbing fixtures, etc. For this project the demolition was significant. In order to accommodate the new rear addition, all 3 stories of the original rear brick wall had to be completely removed. To make way for the new 3rdfloor addition, the original roof will be removed entirely. On the interior all of the original walls, cabinetry, radiators, plumbing, electrical wiring and fixtures were completely removed. Even the original stairways were removed since they will be in a different location in the new design – this is what is typically referred to as “gutting” the house. While the housing stock here in DC spans several centuries, the majority that come into our office as renovation projects were built between 1890-1930. Homes of this era can often contain old layers of lead paint and asbestos (which was used widely in many different building products from flooring to insulation to siding). These materials are hazardous and should be removed by professional abatement contractors who are trained in the proper removal and disposal of these materials. Another common concern comes from the very dust that is produced when removing old building materials since it commonly contains significant amounts of mold and other contaminants that can cause respiratory problems. These materials and conditions should not be overlooked and proper measures should be taken during the removal and disposal of materials that are to be removed from the building. Another consideration that we recommend to our clients during the demolition phase of the project is the opportunity to salvage certain materials that are being removed for re-use or recycling. This is commonly referred to as “de-construction” and can help to divert significant amounts of waste from ending up in the landfill. It is generally advisable to consult with a de-construction contractor prior to the start of demolition work in order to identify which materials, if any, are candidates for salvage. In most municipalities today construction waste is required to be sorted and hauled to different facilities. Metals such as copper and steel are good candidates for recycling. The goals should always be to a.) dispose of all materials properly, b.) salvage or donate any worthy materials for re-use, and c.) minimize the volume of material that will end up in the landfill. Another concept that is worth mentioning whenever we discuss demolition is that of temporary “shoring”. This refers to any temporary measures or construction that will be required to support the building in the time between the removal of the existing components until the installation of the new structural components. Shoring often includes temporary posts and beams that must be securely installed by the contractor prior to removing portions of the existing building. In this project since so many walls are being removed and new openings are being created within the walls and floors (for new windows and stairways accordingly) it was necessary to install a temporary bearing wall at the basement and 1stfloor levels in order to support the existing floor framing during construction. Demolition often goes quickly once started so this is often a time when it appears that a lot of progress is being made, which can be very satisfying (especially after months of waiting for permits to be approved). It can be both scary and deeply satisfying to see the old, worn and dilapidated parts of the building being removed to make way for the new construction to come. This is also the phase when you get to see the real “bones” of the building and to identify areas in need of repair. This is generally the time when we remind ourselves of the common saying that “it’s going to get worse before it gets better”. This project, like so many that we undertake for our clients, faced a list of challenges in the DCRA permit review process. DCRA’s permit reviews have gotten increasingly more focused over the past several years, but we have been actively following and keeping pace with their increased efforts. A single-family house renovation and addition such as this one is reviewed by as many as 8-10 separate review disciplines, each with their own comments and requirements. But finally, after multiple rounds of comments and 8 months of review, we were granted our building permit and allowed to start construction. Keep in mind that while the proposed drawings were under review at DCRA, we had gone ahead and pulled a separate demolition permit that allowed us to remove all of the interior (non load-bearing) walls and finishes (we highly recommend this to all of our clients when possible as it allows everyone to see the actual structural members). During this time we also had exploratory test pits dug at the corners in the existing basement to determine the depth, size and soil conditions of the existing footings (aka “footers”). This information along with a simple soil bearing report (prepared by a licensed geo-technical engineer) allowed our structural engineer to determine how much the basement slab could be lowered along with sizing any new foundation work needed to support our new design. Our budget for the renovations is roughly $250,000 which also creates a challenge for such an extensive renovation in today’s DC construction market. In an effort to try to stay within this budget we decided to work directly with each of the individual sub-contractors rather than hiring a general contractor to manage all of the various components of the project. Since we have worked closely with many different contractors we were able to find a team of subs all with competitive prices and whom we think will do a good job on the project. This approach where the architect becomes involved in the day-to-day oversight and management, more commonly referred to as a “Design-Build” approach, also allows us to modify and adapt the design and details along the way in response to unforeseen flaws within the existing building and in response to budget concerns. This design-build process also allows us to become intimately familiar with all of the details and particulars of the project. It’s very exciting for us as architects to be allowed to become so involved with the construction process.